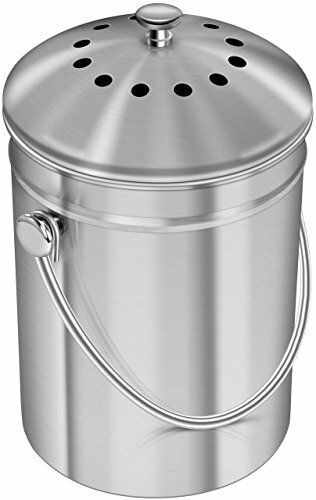 Get the most value for your money with Top-Rated Professional Grade Compost Bin! It’s time you trade up from that ugly and eco-unfriendly plastic pail you’ve been using, to this stylish canister that you’ll be proud to display on your kitchen counter. 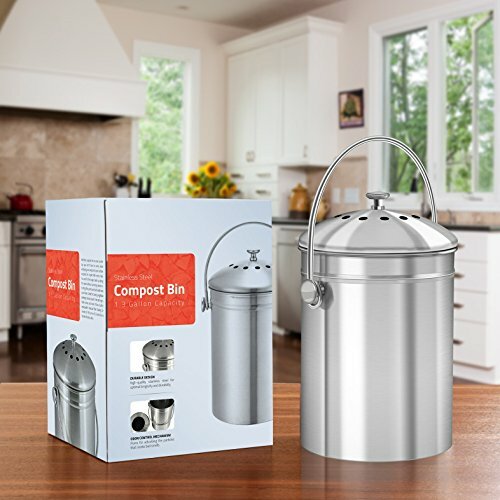 Our Compost Bin is sleek and stylish and is specifically made to store kitchen waste such as vegetable peelings and can be stored perfectly on kitchen counter tops or under the kitchen sink. No need to hide it under the cabinet or under the sink. It won’t rust, scratch or chip, and it’s easy to clean. Plus, it doesn’t harbor bacteria or leach unhealthy chemicals as plastic containers can do; this is especially important if your compost will be used on food crops.